Neuronal dendritic trees are complex structures that endow the cell with powerful computing capabilities and allow for high neural interconnectivity. Studying the function of dendritic structures has a long tradition in theoretical neuroscience, starting with the pioneering work by Wilfrid Rall in the 1950s. Recent advances in experimental techniques allow us to study dendrites with a new perspective and in greater detail. 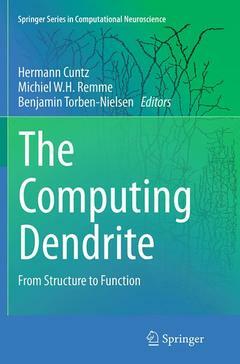 The goal of this volume is to provide a résumé of the state-of-the-art in experimental, computational, and mathematical investigations into the functions of dendrites in a variety of neural systems. The book first looks at morphological properties of dendrites and summarizes the approaches to measure dendrite morphology quantitatively and to actually generate synthetic dendrite morphologies in computer models. This morphological characterization ranges from the study of fractal principles to describe dendrite topologies, to the consequences of optimization principles for dendrite shape. Individual approaches are collected to study the aspects of dendrite shape that relate directly to underlying circuit constraints and computation. The second main theme focuses on how dendrites contribute to the computations that neurons perform. What role do dendritic morphology and the distributions of synapses and membrane properties over the dendritic tree have in determining the output of a neuron in response to its input? A wide range of studies is brought together, with topics ranging from general to system-specific phenomena—some having a strong experimental component, and others being fully theoretical. The studies come from many different neural systems and animal species ranging from invertebrates to mammals. With this broad focus, an overview is given of the diversity of mechanisms that dendrites can employ to shape neural computations. Part 1: Dendritic morphology.- The cell biology of dendrite differentiation.- Archetypes and outliers in the neuromorphological space.- Neuronal arborizations, spatial innervation and emergent network connectivity.- Shaping of neurons by environmental interaction.- Modelling dendrite shape from wiring principles.- A statistical theory of dendritic morphology.- Reverse engineering the 3D structure and sensory-evoked signal flow of rat vibrissal cortex.- Optimized dendritic morphologies for noisy inputs.- Part 2: Dendritic computation.- Noisy dendrites: models of dendritic integration in vivo.- Distributed parallel processing in retinal amacrine cells.- Dendritic computation of direction in retinal neurons.- Rapid integration across tonotopy by individual auditory brainstem octopus cells.- Computing temporal sequence with dendrites.- Modelling the cellular mechanisms of fly optic flow processing.- Biophysical mechanisms of computation in a looming sensitive neuron.- Biophysics of synaptic inhibition in dendrites.- Role of nonuniform dendrite properties on input processing by GABAergic interneurons.- Subthreshold resonance and membrane potential oscillations in a neuron with non-uniform active dendritic properties.- A trade-off between dendritic democracy and independence in neurons with intrinsic subthreshold membrane potential oscillations.- Dendrites enhance both single neuron and network computation.- Dendritic size and topology influence burst firing in pyramidal cells.- Stochastic ion channel gating and probabilistic computation in dendritic neurons.- Cellular and dendritic memory allocation.- Synaptic plasticity and pattern recognition in cerebellar Purkinje cells.- Response of gap junction coupled dendrites: a sum-over-trips approach.- Automated parameter constraining of single neuron models.- Morphological reduction of dendritic neurons.- Index.